On a very warm sunny afternoon a couple of weeks ago, much like today was and the next couple of days will be in NYC, I was walking in midtown and was feeling very thirsty. I happened to notice an all-vegetarian salad bar called SoomSoom55, and walked in to see what was available. 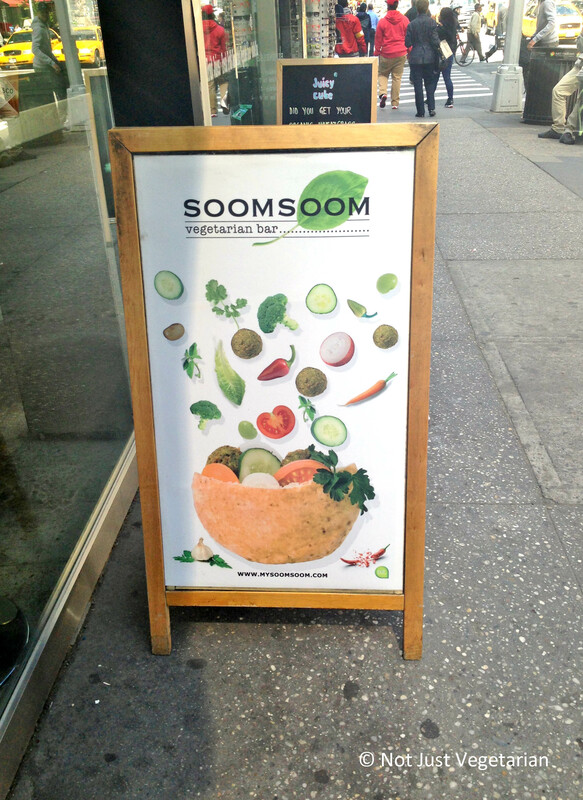 At SoomSoom, you can get falafels, hummus, and sabih and add as many vegetarian toppings as you like. I also spotted some juices, cold teas and lemonade. There are very few seats to sit at SoomSoom55, but there are a couple of bar seats by the entrance. 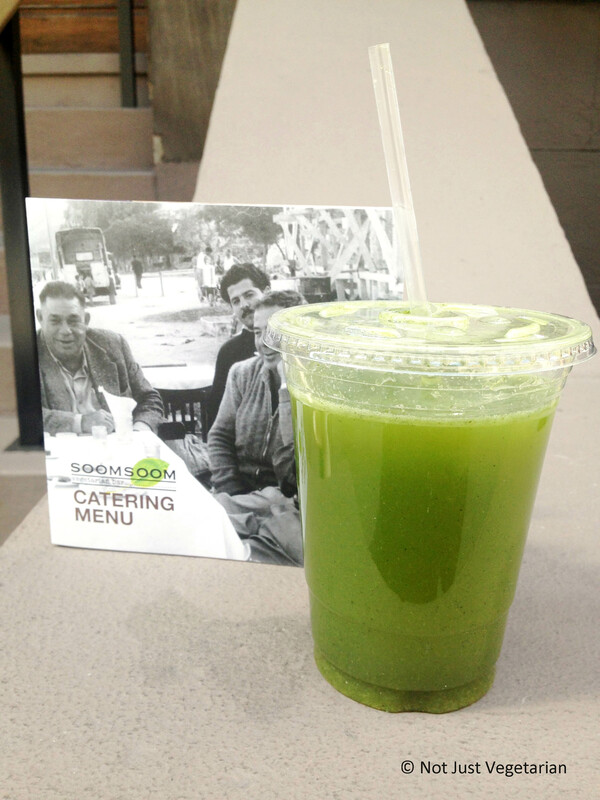 SoomSoom uses natural ingredients and is kosher certified as well. It is closed on Shabbat and Jewish holidays. The day I walked into SoomSoom55, there was lively music playing loudly and I felt like I was on vacation somewhere in the Mediterranean. I saw a mint lemonade and knew instantly that is what I needed to quench my thirst that day. This lemonade was extremely refreshing. What is different about this SoomSoom mint lemonade, is that fresh spearmint leaves are blended well with the lemon juice and sugar- so it’s a lovely green and has a strong minty flavor. I walked out of SoomSoom55 feeling refreshed with the mint lemonade and very proud of myself for having spotted an all-vegetarian (kosher) salad bar. When I mentioned this discovery to a couple of my friends (who would appreciate vegetarian and kosher), they went “Oh! I thought you knew all about SoomSoom, I am surprised that you did not! There is one on the Upper West SIde that has been around for a while” and then reality hit me – I am NOT (?) 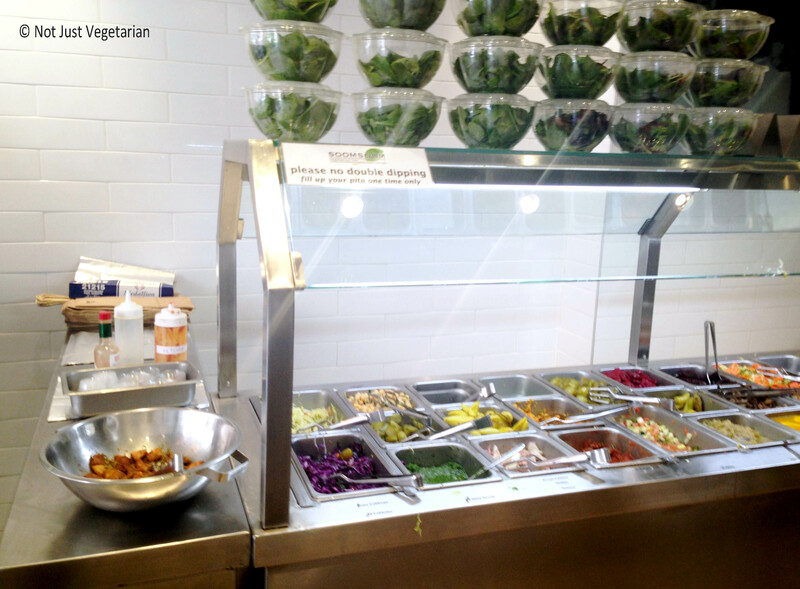 one of the first few to discover an all-vegetarian restaurant / salad bar. Whenever I go to SoomSoom next, I will be sure to try one of the regular menu items – falafels / sabih / hummus and I will share my experience here on Not Just Vegetarian. In the meanwhile, I am happy to spread the word about Soom Soom’s mint-lemonade that I love…. What are your go-to refreshing drinks for these super hot summer days? Please do share…..